John R. Nevins was an architect and civil engineer who worked in Seattle from 1902 to 1932. With business partner Earl G. Park, he platted the Nevins & Park Addition in Wedgwood, and Nevins lived on that block from 1916 to 1932. The Nevins & Park plat is five acres of land which was developed as one long block from NE 82nd to 85th Streets, 28th to 30th Avenues NE. John R. Nevins was born in 1876 in Adams County, Illinois. There are few records of his early life but it appears that he studied at the University of Illinois in the 1890s before coming out to Seattle. The first definite notation of Nevin’s presence in Seattle is in the city directory listing of 1902, giving his occupation as an architectural draftsman for the firm of Charles H. Bebb and Louis L. Mendel, architects. 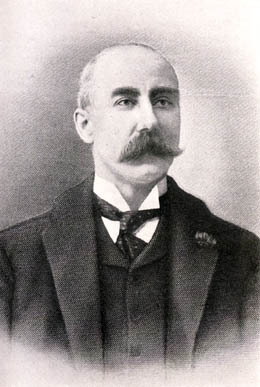 Charles H. Bebb, architect, had a long and successful career in Seattle, his beloved adopted city. Photo courtesy of Clarence Bagley’s History of King County. British-born Charles H. Bebb came to the USA in 1888 and worked in Chicago for a construction company. He became involved with the development of commercial fireproofing, and in that capacity he was sent by his company to Seattle in 1890 to oversee a project. Bebb fell in love with Seattle and determined to return as soon as possible. In late 1893 Charles Bebb brought his wife and moved permanently to Seattle, opening his own architectural office in 1898. After forming a partnership with Louis Mendel in 1901, the office of Bebb & Mendel was increasingly successful and they had to hire more architectural draftsmen. In the days before computer-assisted drafting, it took a lot of time to draw up architectural plans and it was necessary to have a draftroom of workers. In the year 1902, around the same time that 27-year old John R. Nevins began working at Bebb & Mendell, 19-year-old Earl G. Park joined the firm, as well. In the next three years Park was always listed as a draftsman or architect; Nevins was at first listed as a draftsman, but then as an architectural, civil, or structural engineer. Property records show that, in addition to their regular jobs at Bebb & Mendel, John R. Nevins and Earl Park went in together to invest in land and build houses to sell in various neighborhoods in Seattle. In 1918 the two men platted the Nevins & Park Addition in Wedgwood, and they chose to build houses there for their own families. The plat was one long block from NE 82nd to 85th Streets, 28th to 30th Avenues NE. Nevins and his wife Lettie were the first to live on the property in 1916, according to their residential listing in the city directory. (Nevins & Park had bought the five-acre tract but had not yet filed for the plat name of the Nevins & Park Addition.) Unfortunately no house number was listed for the Nevins, because there were no house numbers in Wedgwood until about 1932. The Nevins’ city directory listing for the year 1916 is “E. 85th Street southwest corner 30th.” This listing, and property tax records showing a structure on Lot Number One of the plat, indicates that Nevins must have lived at what is now 8255 30th Ave NE. Comfortable and picturesque log cottage with one-half acre level land in established neighborhood on top of hill with view of surrounding country. $1550; $300 cash, balance terms. Old Bothell Highway to 82nd Street and east three blocks. J.R. Nevins, East 85th and 30th Northeast. 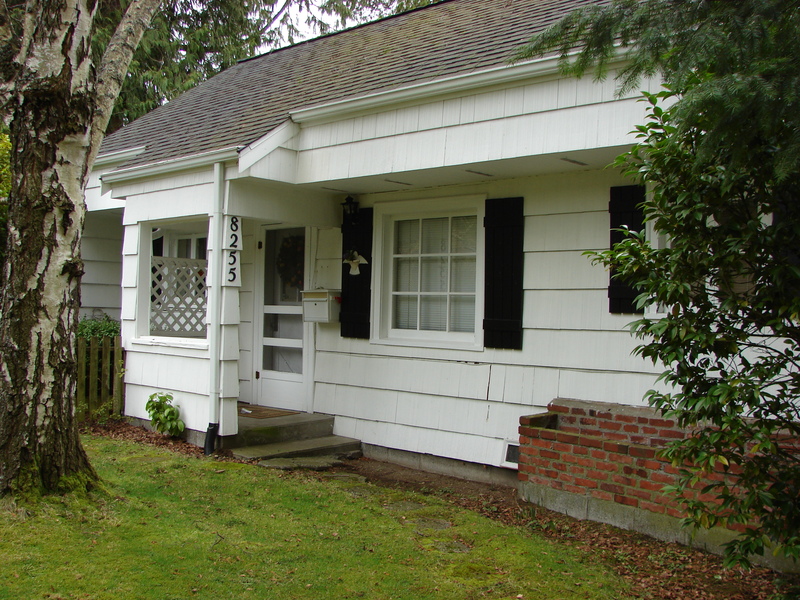 The little house at 8255 30th Ave NE was built by John R. Nevins around and enclosing the walls of a previous log cabin on the site. Property records show that no one took up Nevins’ offer of the log cabin, because as of 1925 Nevins still owned Lot Number One. It appears that Nevins gave up trying to sell the cabin and he simply built the present house around the original cabin, enclosing the log walls. The current owner of 8255 30th Ave NE, having cut into the walls to do electrical work, verified that there are log walls inside the walls of the house. Close by, between Lots One and Lot Two which was the next to the south on 30th Ave NE, Nevins built a well with a water tower to serve the entire block. That is another reason why Nevins would have chosen to first live at the present site of 8255 30th Ave NE, because it was the closest lot to the well water source. With the installation of this water system, by 1918 the block was ready for others to start coming to live there. One of the first new residents was Nevin’s co-owner of the plat, Earl Park, with his wife Lorraine and daughter Dorolis. The Park house at 8225 30th Ave NE was built in 1918. Two other families headed by men who were co-workers of Nevins & Park joined them as residents in the plat: Earl’s younger brother John Park with his wife and daughter, and the Bert Wait family with their five children. John Park was bookkeeper/office manager at the architectural office of Charles Bebb, and Bert Wait was a draftsman like Earl Park. A fifth family shown living in the Nevins & Park plat in 1918 was headed by another architectural draftsman, Paul McAlister, who worked at a different company. The John Park house was closest to the Nevins’ house on 30th Ave NE, but is no longer extant as the house burned down in the 1960s. 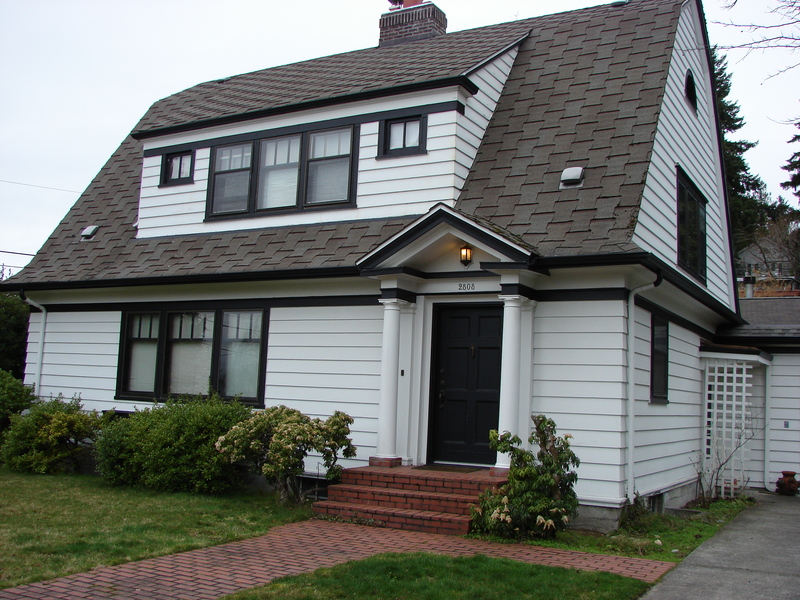 The Bert Wait house is at 8234 28th Ave NE and is still known in the neighborhood as the Big White House on the Hill. The house at 2808 NE 82nd Street was the last house in the Nevins & Park plat which was built and lived in by John R. Nevins. J.R. and Lettie Nevins never had any children, and probably for this reason they were able to be more mobile. Property records indicate that they owned three or four different houses on the Nevins & Park block, although that does not always mean that they lived in each of these houses. The last house which Nevins did live in on the block, was at 2808 NE 82nd Street. That barn-shaped house, built in 1925, is a Dutch Colonial on the same pattern as Bert Wait’s big house on the hill, 8234 28th Ave NE, but with less square footage. Because the 2808 house is smaller, the front door is not centered as is usual in the Dutch Colonial style. After years of living in small houses without electricity and running water, in 1925 J.R. Nevins built a beautiful new home at 2808 NE 82nd Street. 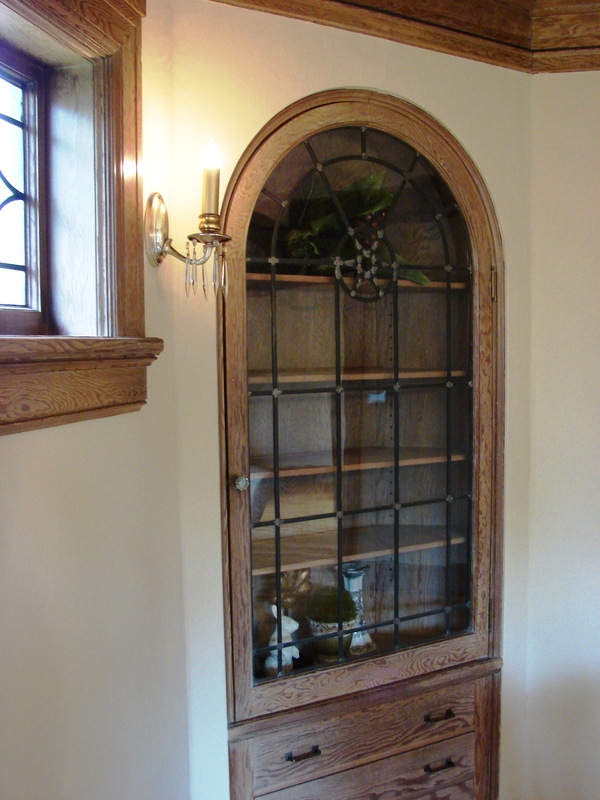 While simple in style, the house at 2808 NE 82nd Street has beautiful interior detailing such as leaded glass windows, wood paneling and built-in shelving and cabinets. We can speculate that John R. Nevins was doing well financially by 1925 and could afford these improvements. He may also have wanted to reward his wife Lettie for the years she had spent living in the log-cabin house at the corner of 85th, living without water or electricity at first, moving from house to house and taking care of Nevins’ mother. From the listings on the census of 1920 we learn that Emma Nevins was living with John & Lettie in the Nevins & Park plat. Emma died December 17, 1924, and her body was returned for burial to her home of Camp Point, Illinois. Property records show that after Emma’s death, John & Lettie then built and moved into their new house at 2808 NE 82nd Street in 1925. Sometime in the period of 1916 to 1918 while Nevins was developing the Nevins & Park block with its water system and new houses, Nevins left the employ of Charles Bebb’s architectural firm and went out on his own, listing himself with his own office downtown. One of the projects he is known to have worked on in the 1920s is the planning and design for the model city of Longview, WA, and its Hotel Monticello, in association with the architectural firm of Schack, Young and Myers. In 1924 Nevins worked in partnership with another architect to design the two-story Liberty Building at 114 Pike Street in downtown Seattle, intended for retail and office use. The Liberty building was renovated in 2006 and today houses the Hard Rock Cafe. In 1926 Nevins designed a building which still stands in the Fremont neighborhood of Seattle at 3400 Fremont Avenue North. The long-time tenant, Costas Opa Greek Restaurant, closed in December 2012, and a Chase Bank branch took its place in 2013. An extensive basement with several rooms, is occupied by the Dusty Strings music store. This building was designed to have commercial storefronts on the ground floor and offices and apartments on the second floor. The original building owner’s name, David McKenzie, can still be seen on the brick front facing Fremont Avenue North and over the door canopy as shown here, on North 34th Street. The McKenzie building at the corner of 34th & Fremont Avenue was a restaurant for many years and is now a Chase Bank. By the 1930s John R. Nevins was the only remaining man of the original five families who had first lived in the Nevins & Park plat. Earl Park died in 1928 at age 45; his widow Lorraine continued to live in her home at 8225 30th Ave NE until her death in 1969. The John Park and Paul McAlister families moved away, and Bert & Grace Wait got divorced. Grace continued living in the house at 8234 28th Ave NE until all her children were grown, then she sold the house in 1937. In the July 24, 1956 edition of the neighborhood newsletter, Mrs. Park told of the water tower which had supplied the early houses in the Nevins & Park block. Architects were hard hit by the Great Depression which began with the stock market crash in October 1929. Construction of new commercial buildings in Seattle came to a standstill when the money supply dried up, and there was no work for architects or others in the construction industry. It is apparent that John R. Nevins fell on financial hard times. His house at 2808 NE 82nd Street, the last house he had built in the Nevins & Park plat, was foreclosed and sold for $3809.26 at the sheriff’s sale on April 4, 1931. After 1932 John R. Nevins was no longer listed in the Seattle city directory. Court case records show that he had also lost his office in a downtown building due to failure to pay rent. Nothing is known of whether Nevins did any more architectural work after 1932. On the census of 1940 John R. Nevins was listed as an invalid in residence at the Masonic Home in Des Moines, south King County. One of the 1940 census information columns asks where the person was living as of five years’ earlier, and Tacoma was listed as Nevins’ residence in 1935. Since Nevins’ wife Lettie was from Tacoma, it is possible that the couple took refuge with relatives after losing their home in Seattle. In the early 1950s Lettie Nevins’ name alone reappeared in the Seattle city directory. This could mean that John R. Nevins was still living in nursing care rather than at home. Washington State death records show that John R. Nevins died in Seattle on January 13, 1952. See related articles: The Nevins and Park Plat in Wedgwood; The House on the Hill in Wedgwood; Earl G. Park, Architect in Wedgwood. Birth, death, marriage records: Washington Digital Archives. Court cases: accessed on microfilm at Puget Sound Regional Archives, Bellevue, WA. Historic sites index, Dept. of Neighborhoods, City of Seattle: 114 Pike Street, Parcel ID 1975700646, Liberty Building. Shaping Seattle Architecture: A Historical Guide to the Architects. Jeffrey Karl Ochsner, editor. University of Washington Press, Seattle, WA, 1994. Essays on Bebb & Mendel; Bebb & Gould; Schack, Young & Myers. Interviews with residents of the Nevins & Park plat. Property tax assessment rolls and deed indices 1900 to 1930: Puget Sound Regional Archives, Bellevue, WA. Advertisement of log cabin for sale, offered by J. R. Nevins. April 8, 1923, Seattle Daily Times, page 51. “Building to be erected at Fremont Ave and North 34th Street, designed by J.R. Nevins.” June 27, 1926, Seattle Daily Times, page 22. “History of Wedgwood Landmark” (water tower.) The Wedgwood Echo, July 24, 1956, page 4. This entry was posted in 2808 NE 82nd Street, 8234 28th Ave NE, Architecture, Houses, Plat names and tagged early residents in Wedgwood, local builders, Seattle. Bookmark the permalink.